On Thursday August 7th the Dixon Springs Ag Center near Simpson, Illinois will be hosting their Annual Crop Science Field Day event. The Crop Science event ends and noon with lunch provided. After lunch, at 1 PM in the Dormitory basement, the department of Natural Resources, Environmental Sciences (NRES) will be hosting a program featuring Karla Gage, Coordinator of the River to River Cooperative Weed management area. This NFP organization is attempting to clean up the region’s invasive species on a landscape basis one specie at a time. Karla will be discussing the identification and elimination of many of the most common invasive species in the region. 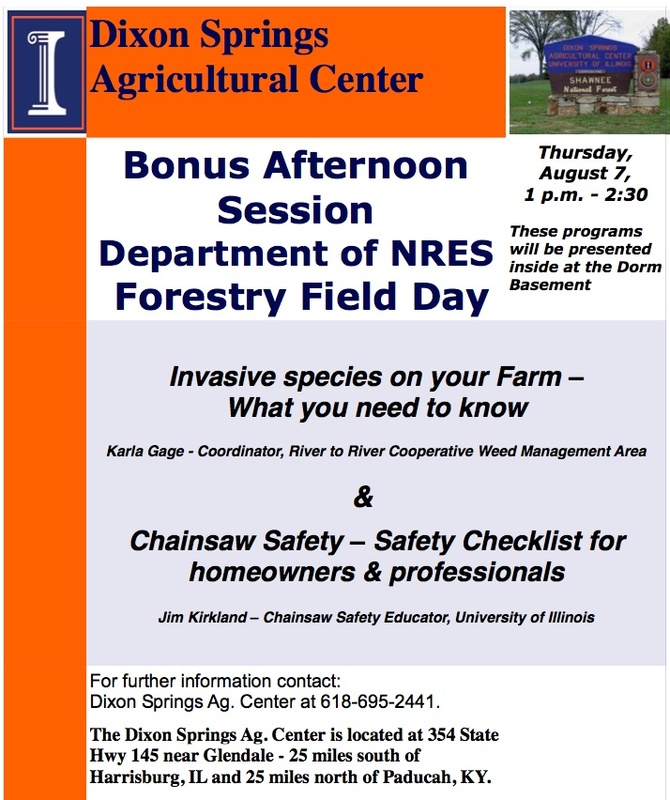 Following Karla’s presentation, Jim Kirkland, Interim Director of the Illinois Forest Resource Center will talk about chainsaw safety including a demonstration of how best to be safe while using a chainsaw. Please come and learn something new that might someday save your life!